I have made this bread again. I will nail it. If you are interested here is a post on my 5th and 6th attempts. I was reading Celia’s post, My Daily Bread, the other day and it brought a smile to my face as I realised just how different we are. When it comes to bread making, Celia seems to be happy to go with the flow… whatever will be, will be. Not me! No way! I want to be boss!! I sat back and had a little chuckle. It is the story of my life. I was a driven child and adolescent, determined to do well in school and get ahead. As a young adult, I was driven to achieve, first in one field and then another. As I got older, I tried not to care so much and felt proud of myself when I was able to accept that I would not reach that pinnacle in the sky (whatever it may have been). But, in retirement, I am out to achieve, all over again. Now, it is all about those pictures in bread cookbooks that get me going. 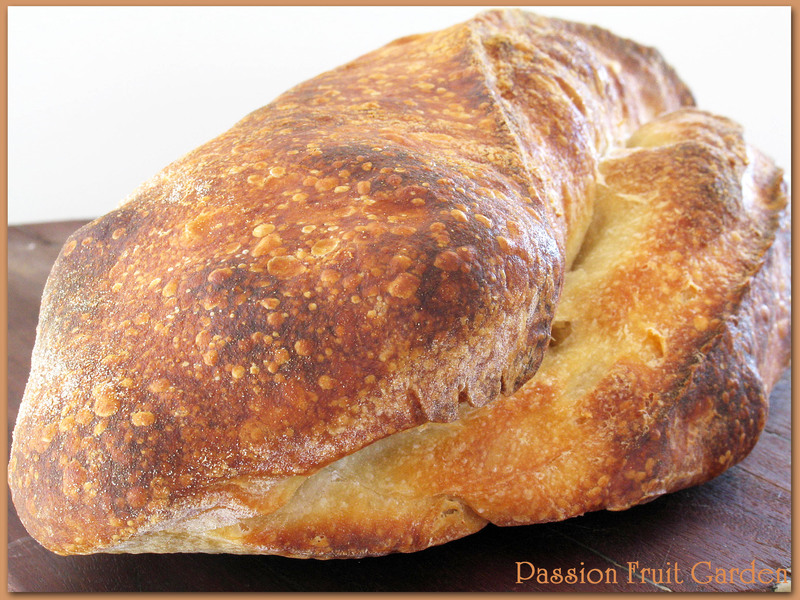 I want to make a loaf of bread just like that …. If my first try doesn’t look like the picture, then I try again and again … Luckily, it is a rare loaf of sourdough that doesn’t taste wonderful, no matter what it looks like. One of the loaves I have been trying to ‘achieve’ is Pane Accavallato (overlapped bread). It is a speciality of Altamura, a town near Bari, Italy, on the Adriatic sea. Little did I know but I have been eating Pane Accavallato for years and years. When I was growing up in Perth, you could buy two sorts of bread: a sandwich loaf or an upright loaf. My mum clearly preferred the upright loaf because that is what we had all the time. Then, somewhere during my adolescence or young adulthood, the Italian loaf appeared. Yep, that is what they were called. They were white, dense bread with a hard, dusty crust. They had a seam on one side that opened up when cooked. When I started being in charge of the bread purchasing, I bought Italian loaves. As time passed, ciabattas appeared, and then sourdough bread and now there is an unlimited choice but still you see Italian loaves in most delis in suburbs where there is a significant Italian population. One day, I was reading Local Breads, by Daniel Leader, and I nearly fell out of my chair. 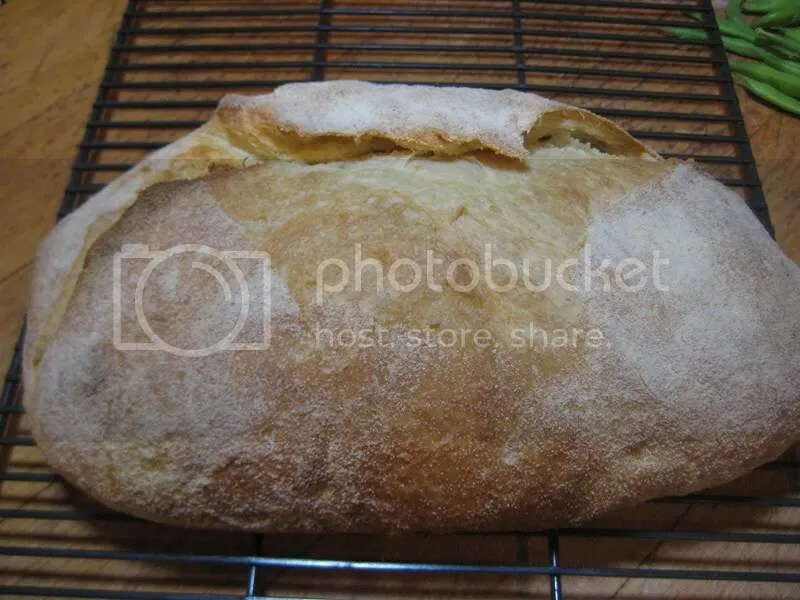 There was a photograph of a bread that look exactly like the Italian loaf but it had the fancy name Pane Accavallato di Altamura (overlapped bread from Altamura). I saw the light. Clearly, an enterprising immigrant had been a baker in Altamura and this is the style of bread he made in his hometown. When he came to Perth, he made bread how he had always done. He, obviously, did very well as his bread was in most Perth delis. So armed with my achievement ethos, I was out to make a loaf just like the ones in the deli. It is a 100% semolina bread and should have a dense crumb. The crust should be hard and dusted with semolina flour. The loaf should have a fold on one side that opens up during the baking. I have tried 4 times. The first time, I used white semolina that I put through my Vitamix several times to make it fine. I followed the instructions exactly and got a close approximation to the photo. The only mar was in the crust – it looked a bit like crocodile skin. Why? I will tell you later. Equipped with beautiful remilled durum semolina flour, I thought I would try again. It surely would be better with this Italian flour. We shall not mention the second try. It was not a good look. Here is a photo of my third try. In this attempt, I decided not to follow the instructions but make the loaf how I would normally do it. I, essentially, followed this technique. I shaped the loaf before second proof. It had the dense crumb but the shaping left something to be desired (the flap merged with the loaf) and I didn’t get that dusty-floured look on the crust. Here is a photo of my fourth attempt. This time I decided to more or less follow the instructions. When all else fails…. I had one hiccup. It took longer for the first fermentation than I anticipated and I had guests knocking on my door before I could shape the loaf so I retarded the dough overnight in the fridge. Apart from that, and a small deviation I thought would solve the crust issue from my first attempt, I did exactly as instructed. Look at the amazing open crumb. I reckon if I had added a bit more water and shaped it appropriately, I would have had a perfect ciabatta. Just when I don’t want large holes, that is exactly what I get. So I must learn to let go of that pinnacle in the sky, the perfect sourdough loaf, and take a leaf out of Celia’s book and go with the flow a bit more. I have to accept that, in the home kitchen, I am not going to get a loaf exactly like the one in the photo but a yummy individual loaf, nonetheless. My Pane di Altamura may not be close and dense, and my ciabatta may not be open with large uneven holes, but they will taste great, anyway. 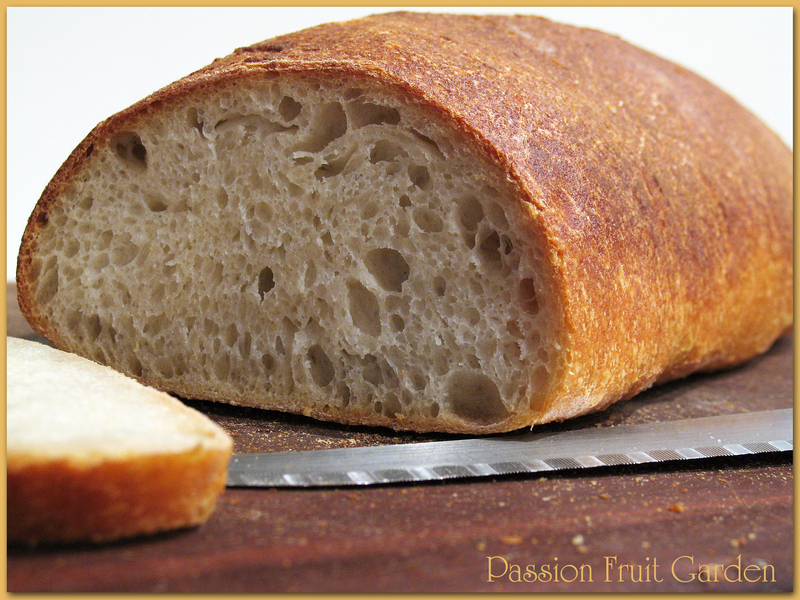 Here is the recipe for Pane Accavallato di Altamura. It is from Local Breads by Daniel Leader. Take 50g of the old starter, feed it with 50g of bread flour and 50g rainwater or filtered water and put back in the fridge or do whatever you normally do to feed your starter. 82g superfine remilled durum semolina flour. Daniel Leader emphasises the need for superfine semolina flour. Mix together, cover with plastic wrap and leave on the bench top. 500g superfine remilled durum semolina flour. If you are in Perth, you can buy Granoro Semola de grano duro rimacinata at Balcatta Fresh on Karrinyup Road. The ‘All About Bread’ durum semolina flour is not fine enough – though, if you have a Thermomix, a Vitamix or other quality blender, blend it for about 4 minutes in 4 x 1 minute bursts, and it will be fine. Put all the ingredients in the bowl of your electric mixer and stir until just combined. Knead the dough in your mixer for 10-12 minutes or by hand until it is smooth (about 20 minutes). The dough should clear the sides of the bowl of the mixer and, near the end of the time, begin to clear the bottom of the bowl. If it clears the sides and the bottom early in the kneading process, add a bit more water. I find the amount of water in this recipe is about right. I don’t usually need to add any more. Transfer the dough to an oiled bowl, cover and leave until it has nearly doubled in bulk. Mine took about 5 hours. This is where I varied from the recipe. The recipe says to shape the dough into a round, dust it with semolina flour and then place the round in a clean dry cloth and tie the opposite corners together. This is to mimic what the villagers used to do. They would tie up their loaves in a tea towel and carry them to the local baker to shape and bake. 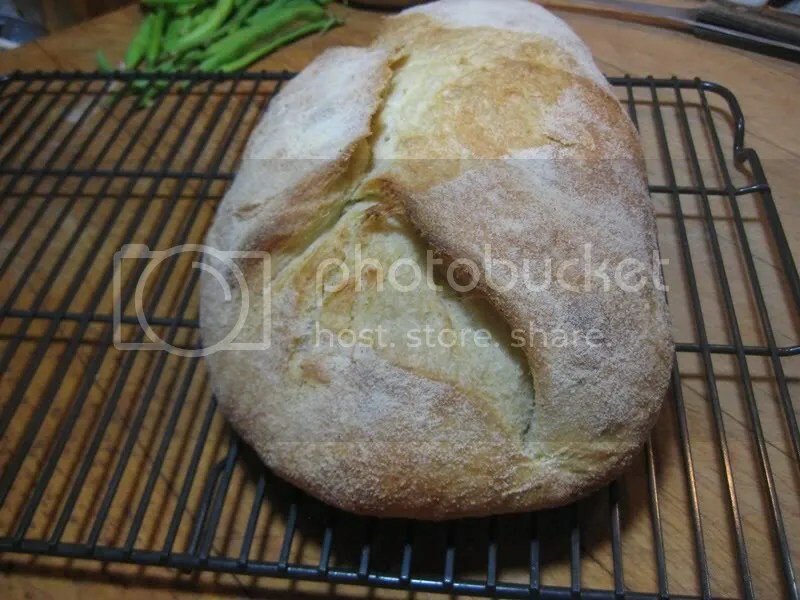 I did this the first time I made the loaf – I even hung it from a stool to proof – but the dough dried out and formed a crust and cracked when I stretched it. The crust between the cracks was perfect but the resultant loaf looked a bit like crocodile skin. This time, I put the dough in a cloth-lined bowl and covered it with some plastic wrap. I also retarded the loaf about 12 hours because I had guests coming. Allow the dough to balloon in the tea towel or bowl. It is ready when you press your finger into it and it bounces back. An hour before you are ready to bake, put a tray on the bottom shelf of your oven and an unglazed terracotta tile about a third of the way up from the bottom. Preheat your oven to the highest it will go. Dust your counter with semolina flour and place your dough on your bench. Pull two sides away from the centre to stretch the dough into a rectangle about 15 cm x 40 cms. Fold the bottom edge to meet the top, press down. Take the folded edge bring it about three-quarters of the way up the top to create a lip. 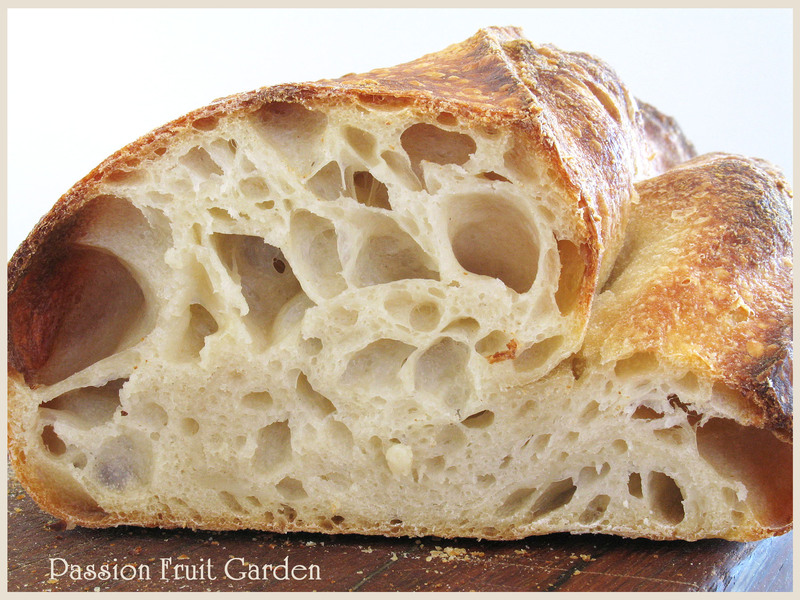 If you have Local Breads check out the photos in the book. I didn’t press down too hard as I didn’t want to deflate the bread totally. Pour about 2 cups of boiling water into the tray on the bottom shelf of the oven. Slide your bread onto the tile and close the door. Turn your oven to about 200° C. Cook for 40-50 minutes or until the loaf is mahogany-coloured all over and golden where it splits open. 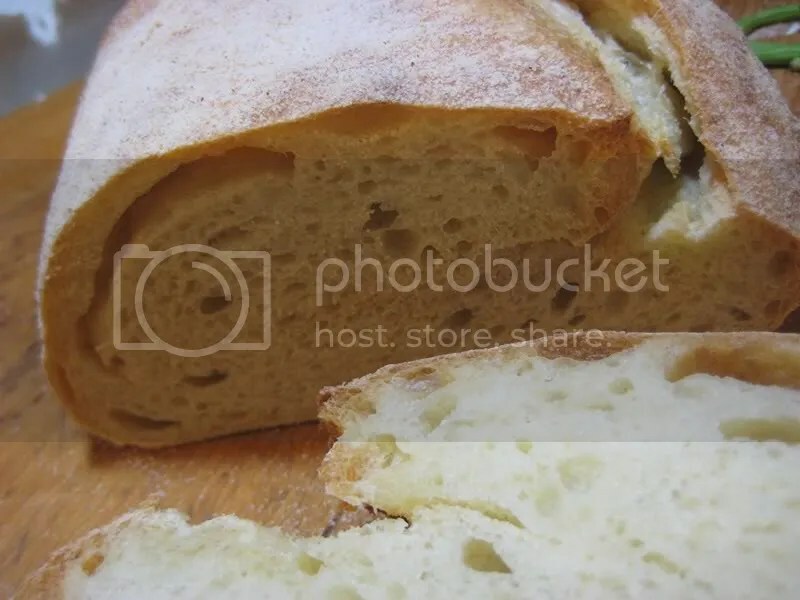 This entry was posted in Bread, Sourdough and tagged Altamura bread, Daniel Leader, Local Breads, Overlapped bread, Semolina sourdough bread by Glenda. Bookmark the permalink. I lOve your perseverance… I am a little like that in the kitchen… growing up I wanted to be a concert pianist. practised 6-8 hours a day when I was 16… then my concert nerves did not allow for that… and i did not have the need to perform… Being a teacher is also rewarding… but cooking… that’s a new magic that I know I can excel in..:) your bread looks wonderful…. sorRY i WENT ON a bit about myself… you just brought back all these memories. Regarding increasing the number of ‘threaded’ comments allowed on your blog, on WP I think the default # is 5, and if you want to increase that, you have to go into your Dashboard (should be at the top left of your blog page). When into the Dashboard, to to Settings/Discussion Settings/ enable threaded comments____ levels deep. You can change the # there to something up to 10 max (which I personally think is better, just in case a discussion gets going). Make sure you ‘Save’ your changes at the bottom of the page – Let me know if you find something different. Done, Thanks Doc … the things you learn. May I suggest you change your WP settings to allow more than 5 threaded comments? (I had to do this recently on my blog!) Otherwise, there is no longer a ‘Reply’ option in the last comment. – as you so desire. I swear I remember that WP once allowed the addition of pics into a comment itself! But I see above that the photo html code has been striped out of the last comment I sent. Damn. OK, then let me add the links to the shots as the next best option. You are a very impatient gal, aren’t you? ‘Where’s the crumb shot?’ Damn, the bread’s got to cool down before it’s cut! Hey Doc, that crumb shot is impressive!! It is supposed to be dense. What type of semolina flour did you use? I am not so impressed with your overlap:( I think it needs to be bolder. Now about this changing WP setting. I would need detailed instructions to do anything technical. BTW I have found if you just reply to the original comment it puts it in the right place. Ha! You’ll be even less impressed when I tell you that this is not a true Pane Accavallato di Altamura. But I loved the idea of this process so much that I simply applied it to my everyday bread, to which I added a good dose of my course semolina – the course stuff bakes up nicely when mixed with other flours – but I’m going into town today, and I’ll see if I can find some of the fine semolina, or at least order some. Oh yeah, and this loaf isn’t sourdough, because I’ve not got an active starter going right now – so it’s just a yeasted loaf – but it tastes great to me, and I think that’s the important thing. Ah, the chemistry of bread – it’s just part of the ‘magic’ and mystery that keeps our suspense up each time we bake – love it. I too am playing with semolina, of which I knew nothing not so long ago – only reason why I even baked my first semolina bread was to try to find something to do with my ‘course’ semolina flour (which I had bought to make pasta – but no! ), and I’ve now made Dan Lepard’s semolina buns sev times – and I love those. So now -with your inspiration- I guess I’ll have to graduate to the ‘finer’ semolina. I love Leader’s stuff, and I have Local Breads, but I had never read the section on Altamura until this morning – thank you – it’s obviously one of the world’s great breads, and I’ve not yet tasted it – however, I will remedy that. Yes, I could just slip my course semolina into my blender and let it go for an hour or two, but I think I have an even better option – in Leader’s book, he notes that Giusto’s Flour Mills (in San Francisco) should have the real thing, and my local health food store has a weekly order from Giusto’s and I know I can slip a special order in with theirs, and thereby save on any outrageous shipping costs. OK, now I’m psyched – and I appreciate your timely motivation, Glenda – I’ve even put on a new batch of sourdough starter, rather than trying to resurrect my old stuff from the fridge (I’m using some organic wheat berries, which simply get soaked for 5 or 6 days and then the soaking water is used to start a new sourdough starter.). I’ll be doing an upcoming post on the process. Thanks again – and BTW, I like the looks of your crumb better than Leader’s – quite impressive. Oh, I forgot a thought I wanted to include – be very careful about using ‘a pan’ as an oven steaming device per Leader’s instructions – and note that he suggests ‘a cast iron skillet’. I once owned 3 beautiful and heavy duty commercial aluminum sheet pans, just the right size for my home oven – I now only own 2, for one I sacrificed to a casual misuse as a steaming device on the very bottom of my oven – upon pouring the boiling water into it, the pan simply warped out of its nice flat shape, and buckled into what is now a rounded surface. Those pans are made from a double layer of metal and so the thickness is deceiving – I now have an old cast iron pan that I’ve dedicated to use as an oven steaming device. I know a pan is not necessarily a pan, but I wanted to save others my experience. I bet you thought I wouldn’t really try this, huh? If it tastes good, eat it. Never mind if it doesn’t look like the picture. Maybe you’re just a wonderfully creative person who has invented their own bread. Anyway, how many times do cooks make food and stylists fiddle with it so they can get that perfect picture. How wonderful to discover the bread from your childhood (though I hope I don’t find the wrapped Wonderloaf of mine). Hi Anne, I know … but in this case I really do know what it is supposed to taste and look like. Yes, it was a great feeling seeing that loaf in the book. Hiya Celia. You have to laugh at yourself, don’t you?